KIEV, Ukraine -- Two European Union ministers urged Ukraine on Tuesday to stop “bluffing” and reach a deal on the release of jailed former prime minister Yulia Tymoshenko because time was running out. Ukraine's FM Leonid Kozhara (C), Poland's FM Radoslaw Sikorski (L) and Sweden's FM Carl Bildt following a meeting with Ukraine's President Viktor Yanukovych in Kyiv, October 22, 2013. Polish Foreign Minister Radoslaw Sikorski and Sweden's Carl Bildt met Ukrainian President Viktor Yanukovych amid a flurry of diplomatic activity aimed at nailing down a compromise on the Tymoshenko row which threatens the signing of landmark agreements with the EU next month. The 28-member bloc says the opposition leader, Yanukovych's fiercest opponent, was the victim of a political trial when she was jailed for seven years in 2011 for abuse of office. Her case has become symbolic for the EU of “selective justice” which the bloc wants ended in the former Soviet republic before agreements on association and free trade are signed in Vilnius, Lithuania, on November 28. Though he badly wants the agreements to cement a course of Euro-integration, Yanukovych is anxious to keep Tymoshenko out of action as a political force as he prepares for the run-up to a re-election bid in February 2015 and has stalled over releasing her. With pressure mounting on him, he has now offered now to sign a law to allow her to go to EU member Germany for medical treatment for spinal problems, if such a draft were adopted by parliament. But he has balked at a call by European mediators to pardon her and wipe out altogether her sentence - something which opposition supporters of Tymoshenko are still asking for. Drafts of possible legislation floated by pro-Yanukovych deputies envisage her going to Germany only as a convicted criminal and returning to Ukraine to complete her sentence after treatment. As politicians from the ruling Regions Party and the opposition wrangled over a solution, the two EU ministers, Sikorski and Bildt, warned time was running out. “The time for bluffing is over on both sides now. It's time for action,” Sikorski said standing alongside Bildt after a meeting of more than one hour with Yanukovych in Kiev. The agreements scheduled to be signed in Vilnius would mark a historic shift towards the West and away from Russia for Ukraine, a former Soviet republic. Irish politician Pat Cox and former Polish President Aleksander Kwasniewski, EU envoys who are shuttling to and fro in pursuit of a compromise, saw Tymoshenko in hospital in Kharkiv where she is being treated under prison guard. They also met a senior member of Ukraine's presidential administration and Prime Minister Mykola Azarov. There was no word from them on how negotiations were going and it was not known if they were still pressing for a pardon for her. The two men will report back to the European Parliament in time for a decisive, pre-summit meeting by the EU on November 18 when the 28 member states will try to map out a joint position on Ukraine. 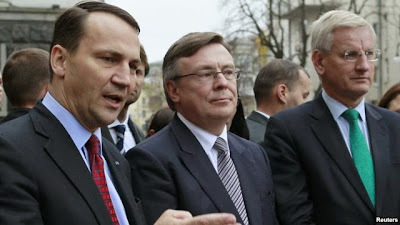 Sikorski and Bildt declined to go into details of what they themselves discussed with Yanukovych. They declined too to say how Cox and Kwasniewski's mission was progressing, but added their findings would be crucial. “We will not go into details, but what they report will be decisive. If there is a green light from Pat Cox and Alexander Kwasniewski there will be a green light for Ukraine in Europe,” Bildt said. “Without a green light from them, there will not be a green light. This is the political reality of the day ... We are now approaching crunch time,” he said. There was no word from Tymoshenko on whether she was prepared to accept Yanukovych's proposal. Her party, Batkivshchyna, said on Monday that the solution lay solely in Yanukovych's hands and did not require any new laws being passed. If Tymoshenko is not released, and major requirements which will insure farther civilized changes in Ukraine, are not adopted by Parliament before the November meeting, Ukraine will be better off not getting the AA at all. Good example is Bulgaria, which is being excepted to fast, now changes are not happening and people suffer. Once again Mr. President, dear Yanukovych!!! Please pardon Tymochenko and be a Hero for all Ukrainians around the world.